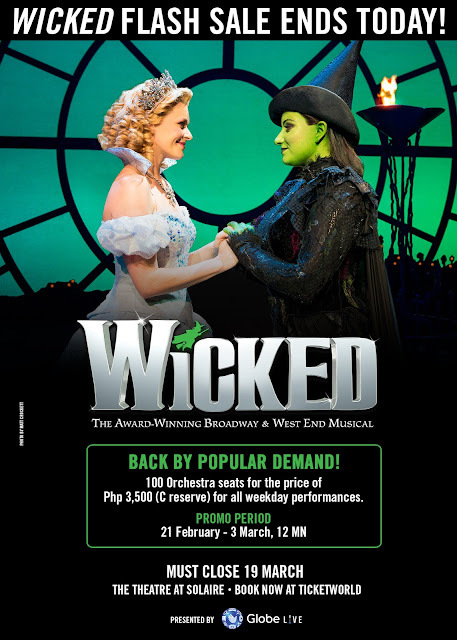 Home Events Musical Sale WICKED Flash Sale Ends Today! WICKED Flash Sale Ends Today! WICKED is suitable for a general audience and contains no profanities. As a guide to parents and guardians, it is recommended for ages 7+. All persons entering the theatre, regardless of age, must have a ticket. Children under 3 years of age will not be admitted. Theatre Foyers open 2 hours before every performance, and the theatre doors open 30 minutes prior. Latecomers will not be admitted until a suitable break in the performance. Please note that loud noises, flashing lights, smoke effects and strobe lighting feature in the production. Dates, times, prices and fees subject to change without notice. Discounts are strictly subject to availability and may be withdrawn without any prior notice. Only one discount applies at any one time. All sales are final. Additional blackout days and other restrictions may apply. Venue Rules and Regulations shall apply. In case you want to be in the loop for latest concerts and events, sign up to Ticketworld's newsletter -- here. I have been a fan of the soundtrack and if money permits I will most definitely watch the musical. For now, I would like to share my favorite song from the musical, For Good with the original cast Kristin Chenoweth and Idina Mendez.